Finally, the day all royal enthusiasts and Anglophiles have been waiting for: the royal christening. We haven't spotted Prince George since he left the hospital in July, so seeing the three-month-old at his first engagement is pretty exciting. Unfortunately, it's already over. The entire christening lasted about 40 minutes, even less than the original 45-minute estimate. Way to stick to the schedule, royals! At least we have some adorable photos to hold us over until the future King to make his next public appearance. 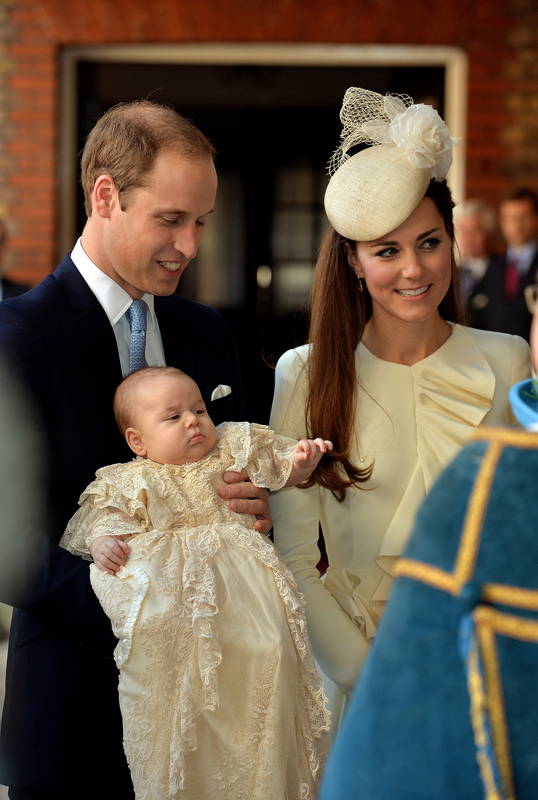 Here are a few at least semi-interesting things to know about Prince George's christening. Maybe, if we're lucky, his first birthday party will be a little more exciting. He may be royal, but George doesn't get his own christening cake. Instead, it's a tier from William and Kate's 2011 wedding cake. It might not taste that great anymore, but it's a really sweet sentiment. The first official portraits of Prince George and his parents were taken by Kate's father, Michael Middleton. For his Christening, the Duke and Duchess decided to go professional— but not royal. Jason Bell was chosen as the official christening photographer, and while his past work is impressive, he tends to focus on celebrities. Some of his most famous work includes photos of near-royalty British celebrities like David Beckham and Paul McCartney. So about that frilly, long-trained, sure-to-be-uncomfortable, satin and lace number that poor little George had to wear today. William and Kate really didn't have a choice in the matter — if they had, I'm sure Kate would've dressed her son is something much more fashionable. (Perhaps a McQueen, like she wore for the royal christening?) The traditional gown is actually a replica of the one first worn by Queen Victoria's oldest daughter, also named Victoria, in 1841. That exact gown was worn in every royal Christening from then until 2004, when the Queen commissioned a replica. Lace can get kind of fragile after 163 years. Since then, this replica has been used, though George is only the second royal baby to wear it. The royal aunt and uncle may have been snubbed as godparents, but they did get to participate in the ceremony, each reading verses from the Bible. But that means someone else was snubbed — Kate's brother James Middleton. He didn't get to be a godparent or read anything at the Christening, though he was in attendance. The BBC's Peter Hunt tweeted a photo of two members of the clergy waiting for the ceremony to start. It's pretty easy to determine that the one on the right wins best dressed of the royal christening. Sorry, Kate.